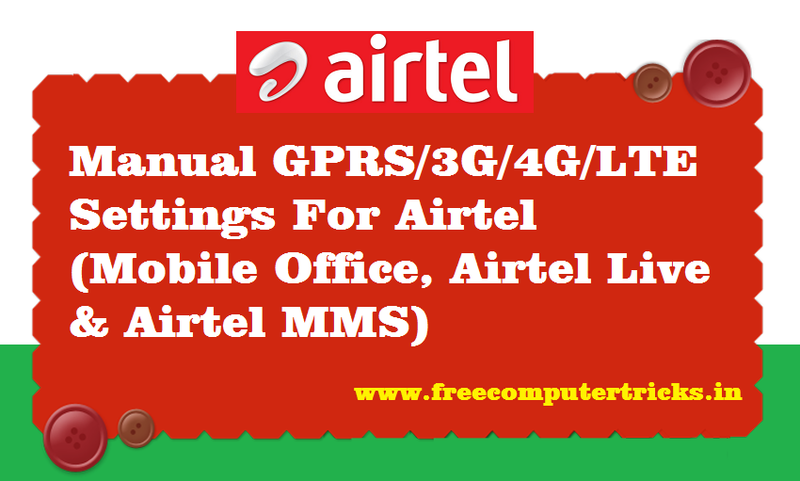 How to manually configure Airtel GPRS/3G/4G/LTE on your Airtel mobile smartphone of feature phone? This is the topic where you will know the full detailed process to configure Internet settings on Your Android smartphone or any feature phone having Airtel SIM card. If you do not get the GRPS 3G or 4G settings from Airtel then you can follow the below configuration to get connected to Internet on your Airtel phone. As you know when you insert Airtel SIM card in a phone for first time and switch on the phone, you will receive a configuration message for Airtel Internet, Airtel Live and Airtel MMS, it will ask to save the configuration settings, just save the it and you will get all the settings done and then you will access Internet on your phone. But in some cases you will not able to receive the settings message at that time you need to configure it manually on your device, so here is the tutorial about how you can manually configure Internet settings on the Airtel phone, please go through the below topic. How to Manually Configure Access Point Names (APN) Airtel GPRS/3G/4G On Your Phone? You can manually configure GPRS or 3G or 4G or LTE Internet settings on your phone and this process is same for all Android smartphones and feature phones. To access Internet on your Airtel phone you need to configure this on your phone, go to Phone settings --> Mobile Networks --> Access Point Names and if you have Dual SIM smartphone then choose the SIM card through which you want to access Internet, then follow the below steps. In some phones the Access Point Names will be in different place in the Phone settings but the configuration process is same on all smartphones, after getting the Access Point Settings please configure it as below or confirm the settings must be like below. Account Name/Connection name – Airtel live! How to Check Airtel Best Offers? You can check The Airtel Best Offers For You On the Airtel App or By Dialing *121#.